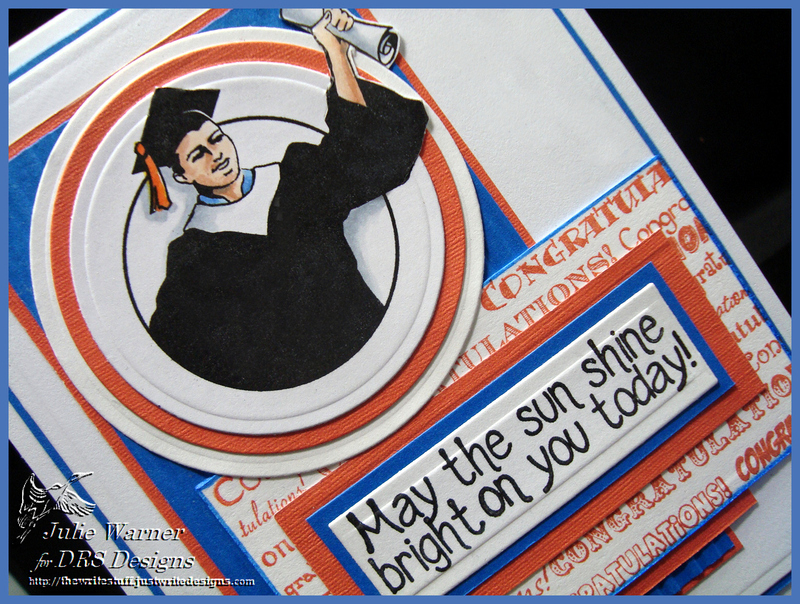 Well the Sketch Challenge on Splitcoast (SC538) seemed like a real challenge and I needed some Grad cards, so these are what I made. I did have to flip sides with the sketch and put that little bar (#4) at the bottom. 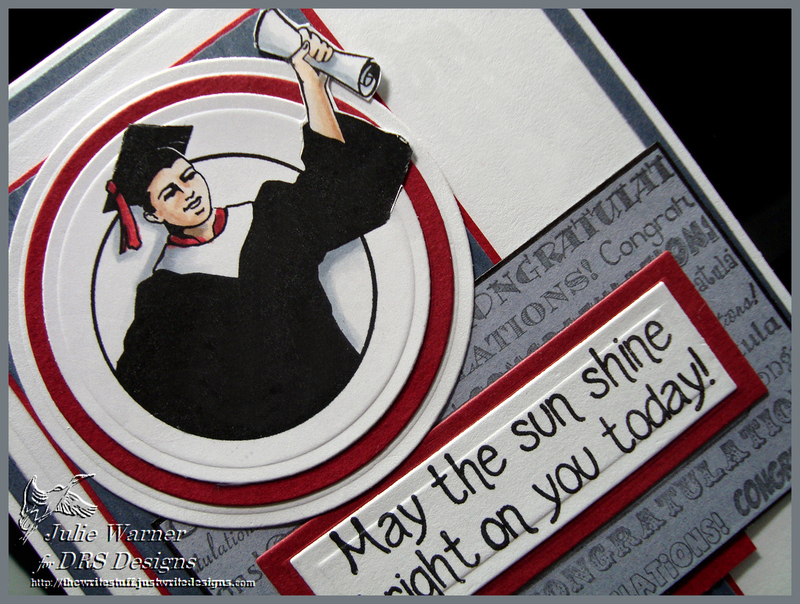 Two of my husband’s nephews are graduating soon, so I really needed to get these made. I think the sketch worked out great and as long as I was making one, another didn’t seem like a big deal. The only changes were the colors. I used the colors of their respective schools. 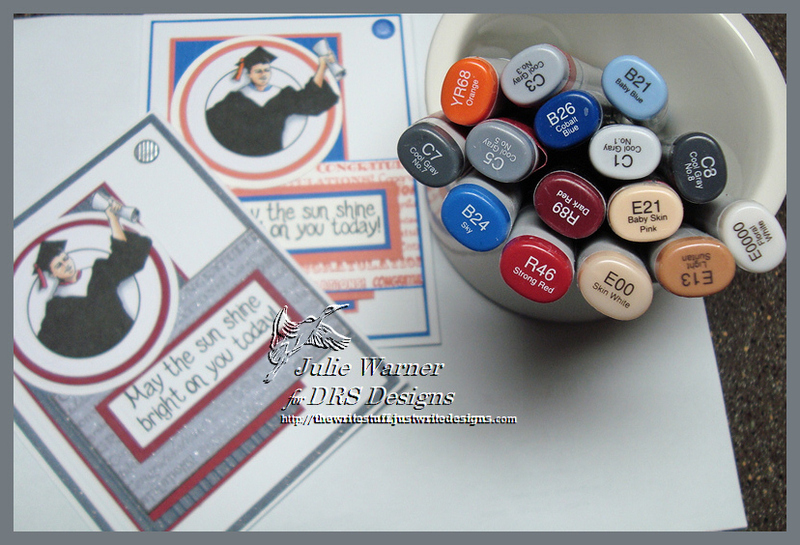 I did find my new Misti purchase helped me out a lot on these cards. I used it to stamp the grad boy once with Memento (so I could color with Copics) but I left it just where it was while I colored it. Then I inked the image with Versafine and stamped on top. With solid images like this, it really made a difference. And this is for the second nephew. Identical except for the colors. Here’s a look at the inside…the second one is the same, just different colors. These are the Copics I used for both..orange & blue for the second & red & gray for the first. 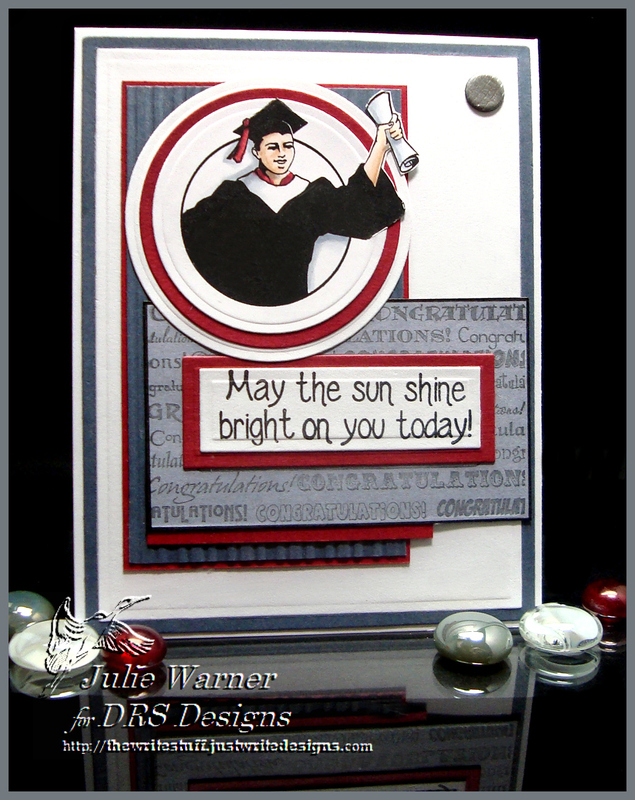 For today’s Color Challenge on Splitcoast (CC528), we have soft colors..sky, pink & sand. I had some designer paper that had close to the same colors so I built my card around it. I’m not sure why the peony looks sort of orangey here..in real life, it’s a lot more pinky. 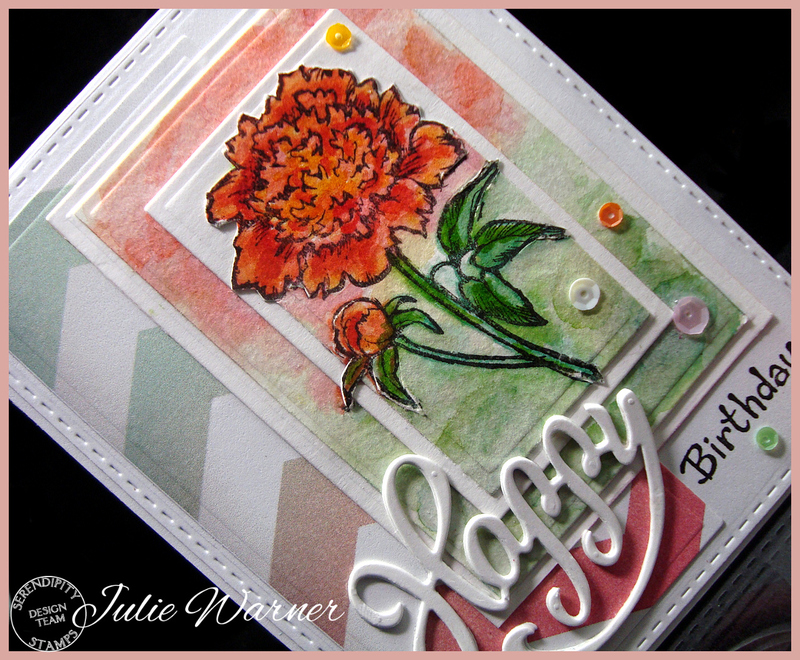 After I water colored the peony & background, I used the out of the box technique to die cut it. I added a white layer then put it back on top of the larger background I cut it from originally. Another white layer then it was added to the stitched layer along with the piece of dp. 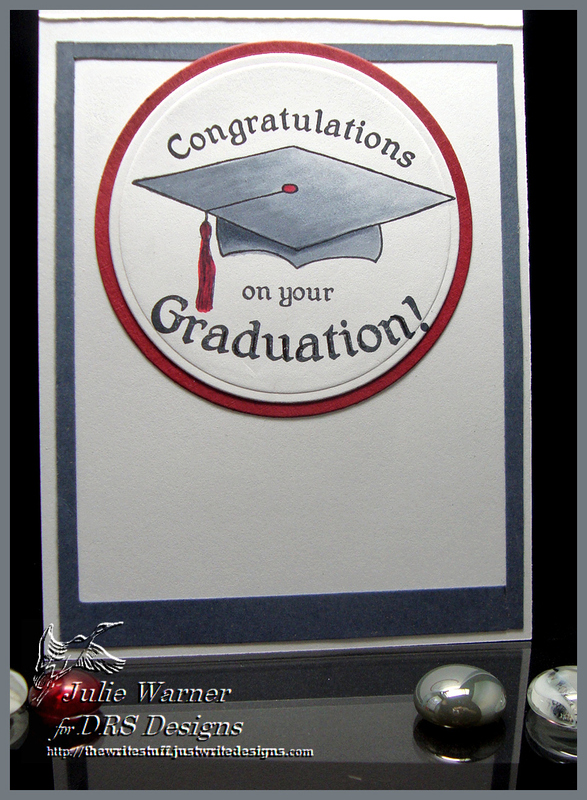 The Happy was die cut 3 times & stacked together for more dimension, then a few sequins added for a little sparkle. The finished card is 4.25 x 5.50. I’m also adding this to the Simon Says Monday Challenge ..anything goes! 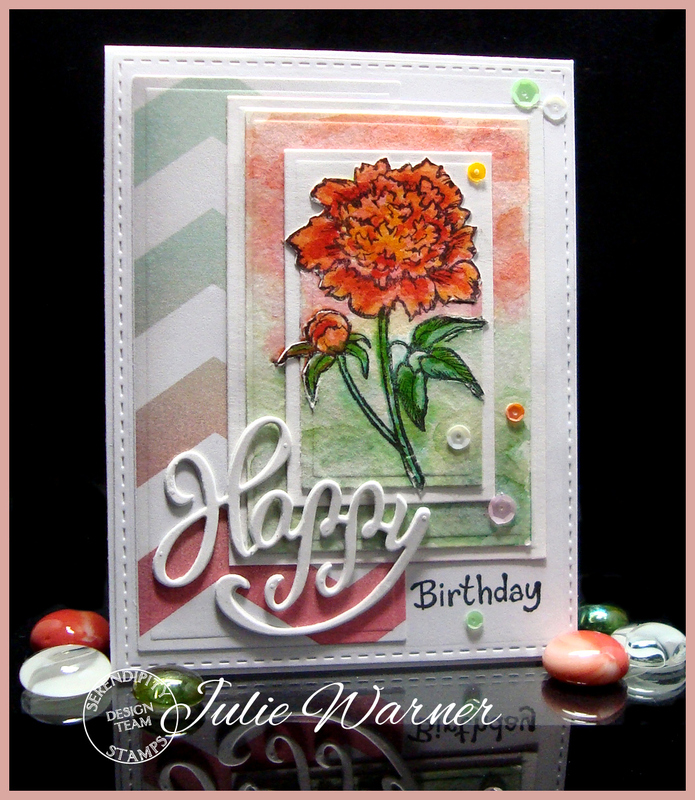 For the Clean & Simple Challenge (CAS322) today on Splitcoast, the challenge to make a card with a cupcake on it. 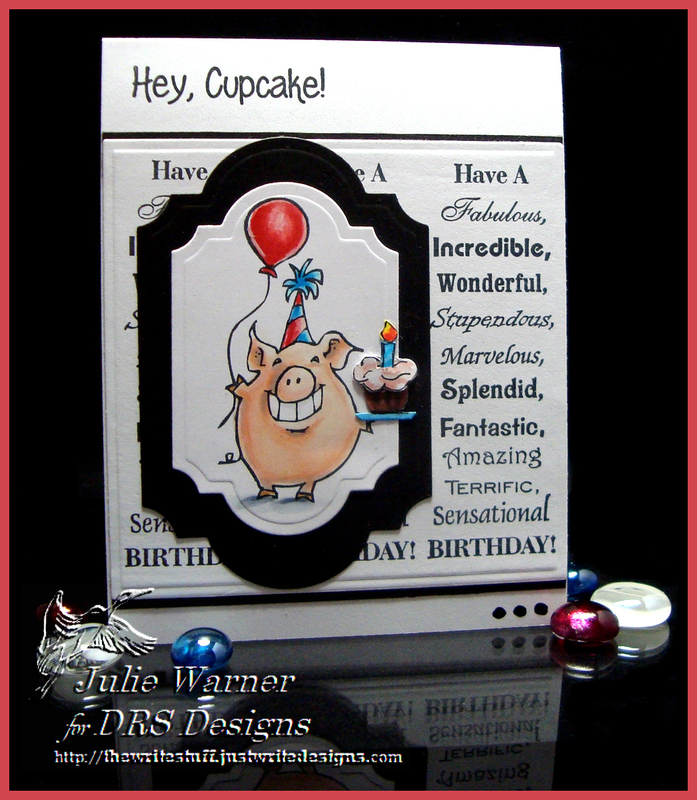 I had this big grin piggie & a fun “Hey, Cupcake!” greeting. 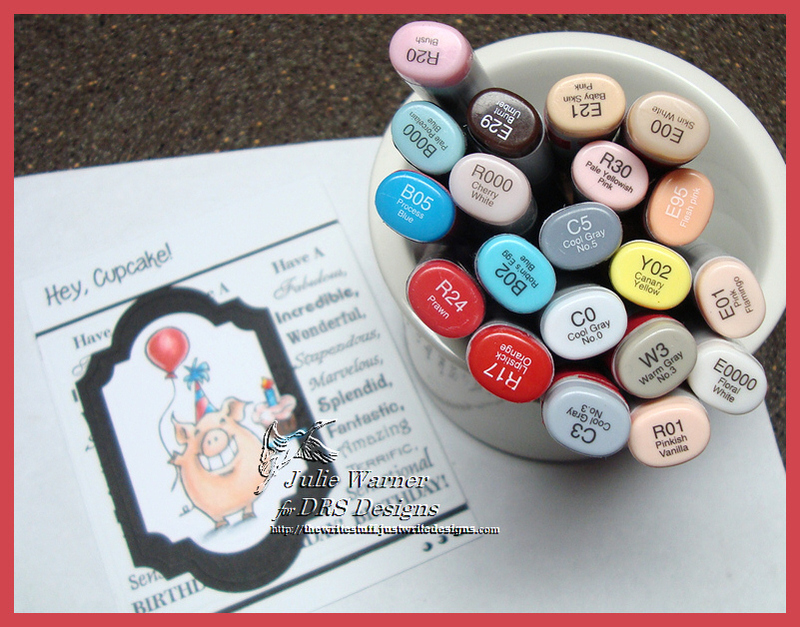 So as I’m putting my card together, I start thinking…I need a really little cupcake. What to do? I started looking at my punches, figuring I should be able to put something together. The bottom of the cupcake is a little teacup punch. I cut off the handle & drew a few lines to make the cake part. The frosting part is a little cloud punch & I drew a few lines to look like frosting. I had a little candle punch, so that was handy. I think it’s just the right size! 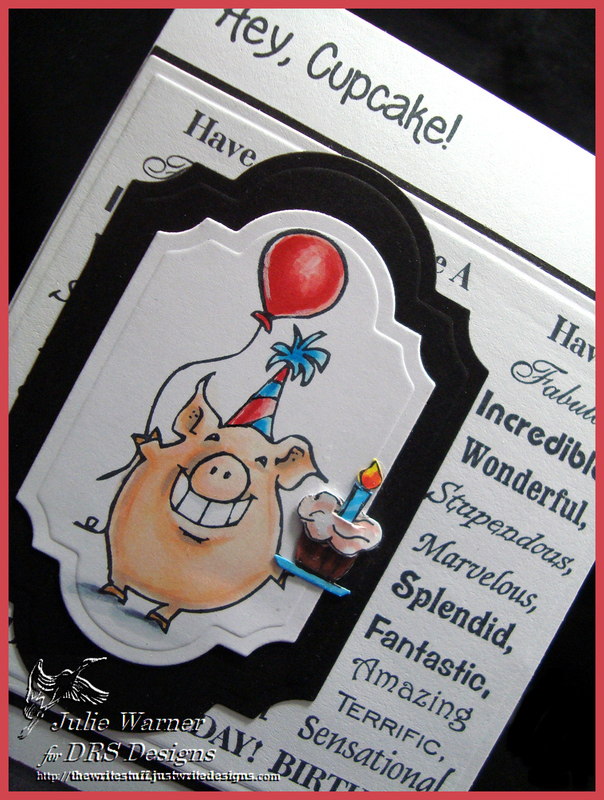 The Wordy Birthday greeting was stamped 3 times on the background & I added a narrow strip of black to the upper & lower edges then added my cupcake bearing pig on top. I used a black glaze pen to add the 3 black dots in the lower right corner. The finished card is 4.25 x 5.50 and these are the Copics I used. Thanks so much for stopping by! 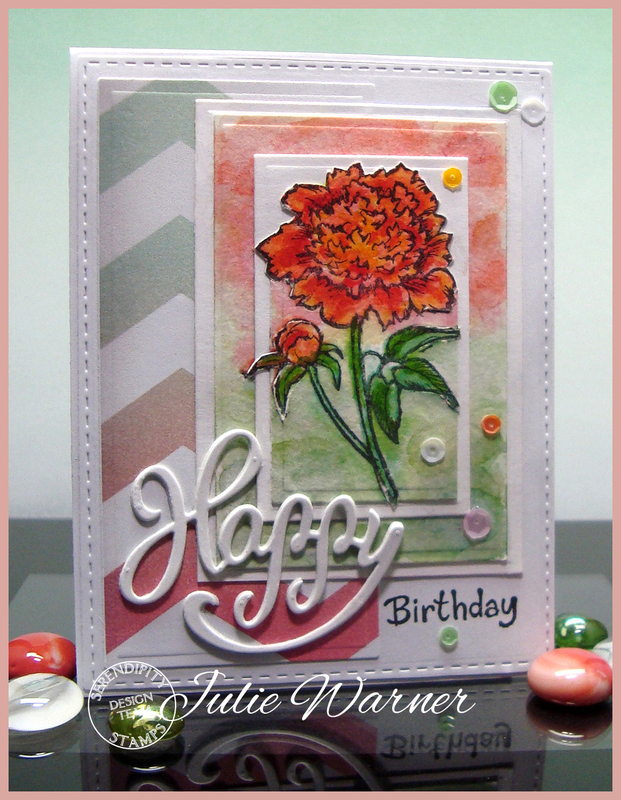 There’s still time to enter the DRS Thursday Challenge..Bloomin’ Beautiful..just have some kind of flower on your card. 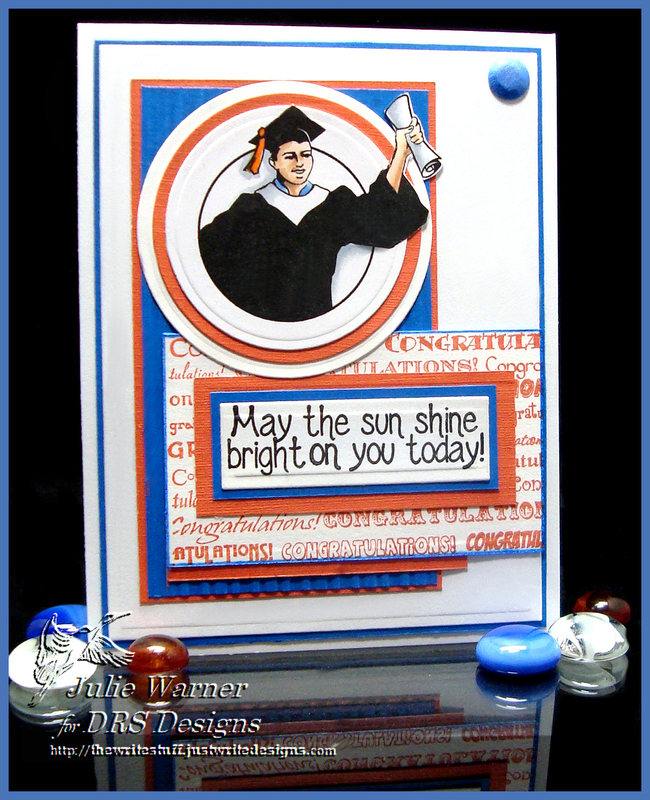 DRS images are not required so head on over & link up!